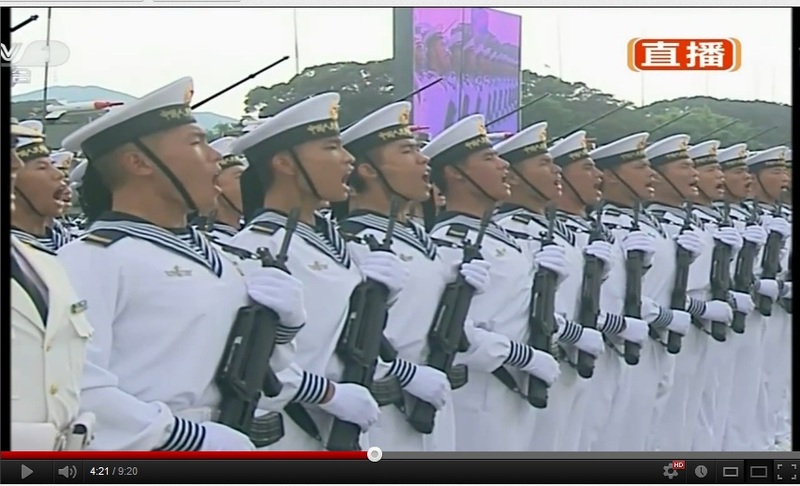 China Defense Blog: Type95/QBZ95-1 5.8x42mm Assault Rifle Hong Kong Debut Reloaded. 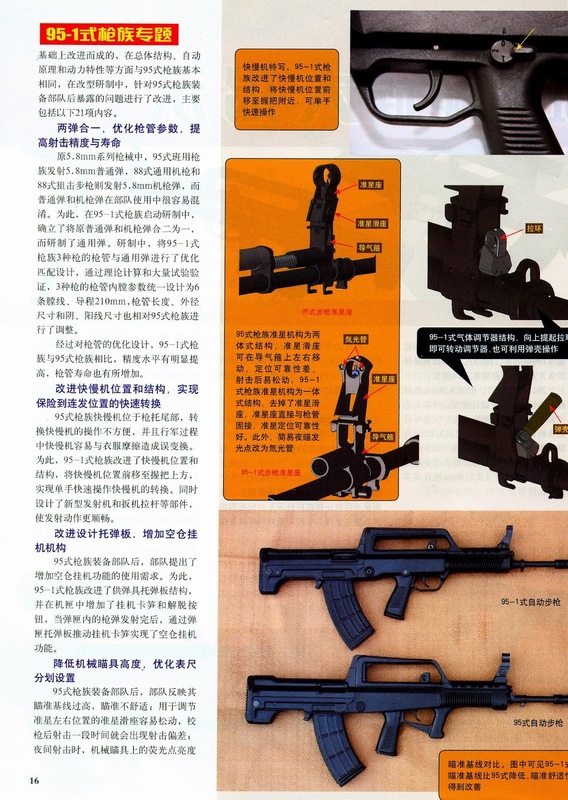 Type95/QBZ95-1 5.8x42mm Assault Rifle Hong Kong Debut Reloaded. 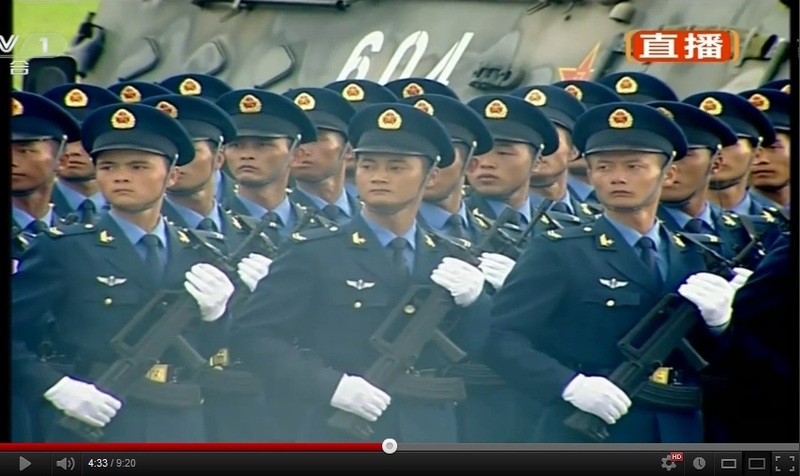 As the outgoing chairman of the CPC, Hu Jintao, parades down the Shek Kong Airfield of Hong Kong while being flanked by 3000 members of the PLA Hong Kong Garrison, China military watchers are excited, but not really surprised, to see the new and improved QBZ95-1 5.8x42mm assault rifle entering service. 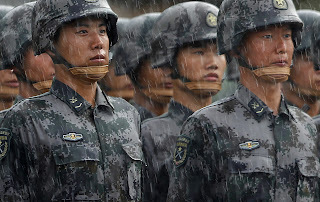 There is a well-known precedence to that – the first unveiled in public during the 1997 handover of former British Crown colony Hong Kong back into Chinese sovereignty. Judging the QBZ95-1, sometimes wrongly called "QBZ95G" in the bloggosphere, one could start by voicing the opinion that this is the much and actually direly needed "A1" version of an otherwise quite decent assault rifle. 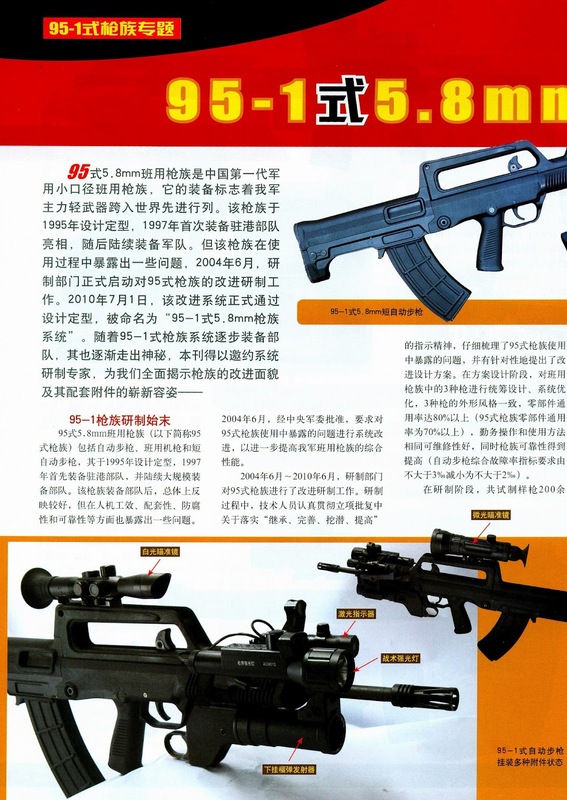 The QBZ95 that has been in service with the Chinese military and export markets is decent assault rifle that originally suffered from a major design flaw, which could have been the result of its rush into service to show off to the world during the 1997 handover. The greatest flaw of course, is the severely awkward placement of the selector-switch: On the stock placed on the left-hand side. 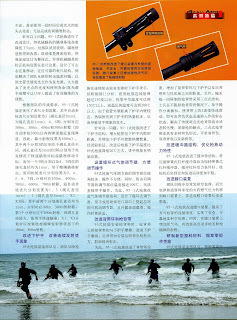 Considering that the PLA standard QCQ05 5.8x21mm SMG features an ergonomically sound selector switch placed above the pistol-grip on the left-hand side, and its own development was not known to be subject to any highly political pressure besides the fact that it was a bid to a PLA competition seeking for the next-generation SMG to replace the venerable Type 85 7.62x25mm SMG, it becomes ever more probable that the first QBZ95 version would not have had this major design flaw, if its development was not limited by an intensely short time frame due to political reasons. 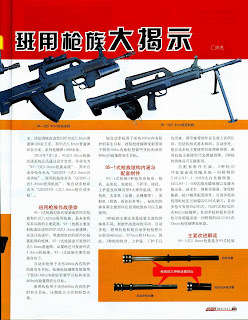 This, in turn, could have made the development and introduction of the "-1" version rather unlikely, considering the frugal nature of the PLA who used the well-liked Type-81 7.62x39mm assault rifle more or less unchanged from its basic configuration since 1983 (ignoring the replacement of the solid-stock by a folding stock for the Type-81-1 version) to this day. 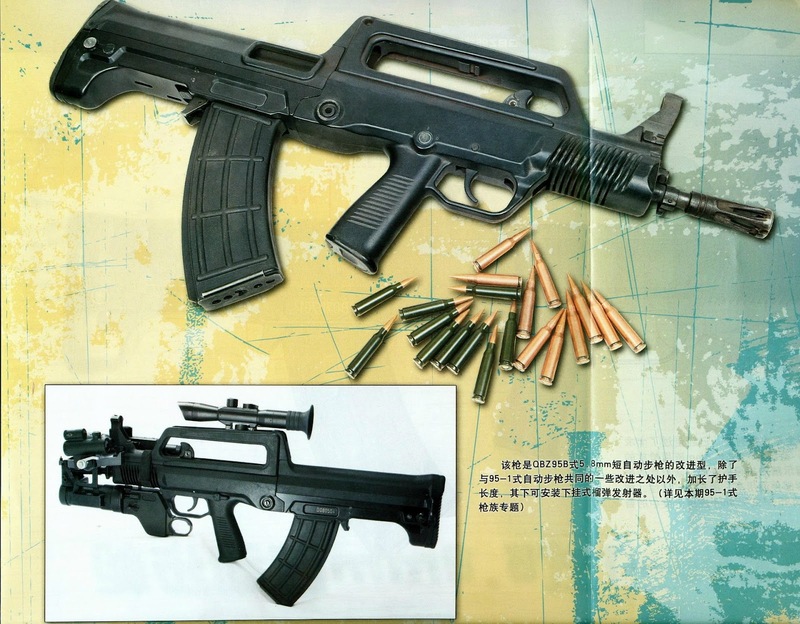 The QBZ95-1 thus sports a selector switch, which is similarly placed at the right-hand side above the pistol-grip, allowing the operator to manipulate the firing modes and safety with his thumb. The other improvements of the QBZ95-1 are of comparably lesser nature, but not to be ignored either: The replacement of the fluorescent illumination-dots on the front-sight with a pair of more reliable and longer-lasting tritium illumination dots, the redesign of the handguard which now features a diamond-shaped cross-section that wont heat up as much from a hot barrel due to the broader gap in-between handguard and the barrel, the addition of two very short rails under the front-sight to allow the mounting of tactical accessories (proprietary, non-picatinny), the lowering of the carrying-handle and the integrated propietary optics rail that now makes it more comfortable for the operator to use mounted scopes and sights, the removal of the integrated front-grip-trigger-guard combo present on the QBZ95 which now allows for custom front-grips and GP-25 styled grenade-launchers to be attached, and last but not least, the redesign of the lower receiver and the ejection port, which now features both a bolt hold-open feature (manually to be manipulated via a switch at the bottom of the lower receiver just behind the magazine port) and a theoretical left-handed operability of the bullpup rifle due to the solution of moving the ejection port 5mm to the front and adding a mechanism forcing the cases to reliably eject in a 45° arc towards the front away from the left-handed shooter's face. 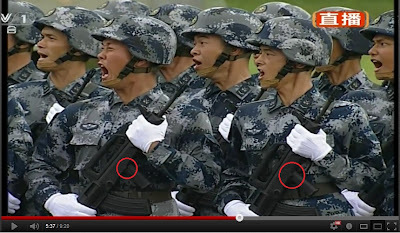 The externally apparent differences -- another thing one must know about the QBZ95-1 was the apparent decision to develop it around a new version of the Chinese 5.8x42mm round. 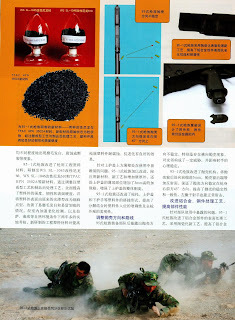 As we know, the previously used DBP87 and DBP95 rounds were subject to several budget-constrains. Due to the reasons of using cheap, dirty-burning powder and a corrosive primer (DBP87), utilizing lacquered steel-casings (DBP87, DBP95) performance was not insubstantially affected. 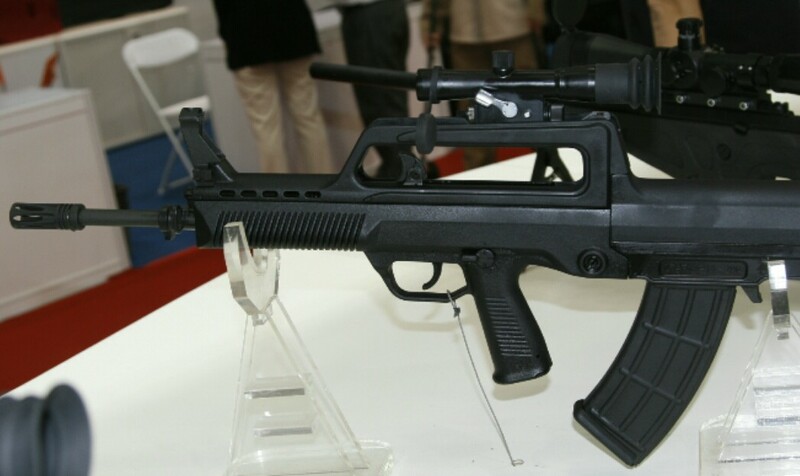 The new type round the QBZ95-1 family is to be chambered for is designated as DBP10, which uses non-corrosive primer, a clean burning high-powered propellant, chopper-coated steel-casings, and a new bullet, which features a long, streamlined body not unlike the DBP88 5.8x42mm "heavy round" designed for LMG use in mind. 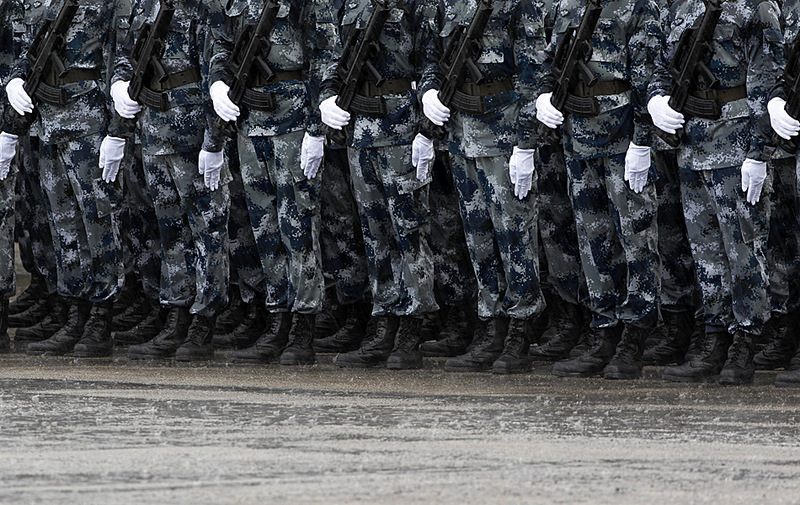 This new bullet reportedly features a chopper-alloy jacket and a hardened steel-core with better armor piercing performance compared to the mild-steel cored DBP87/95. 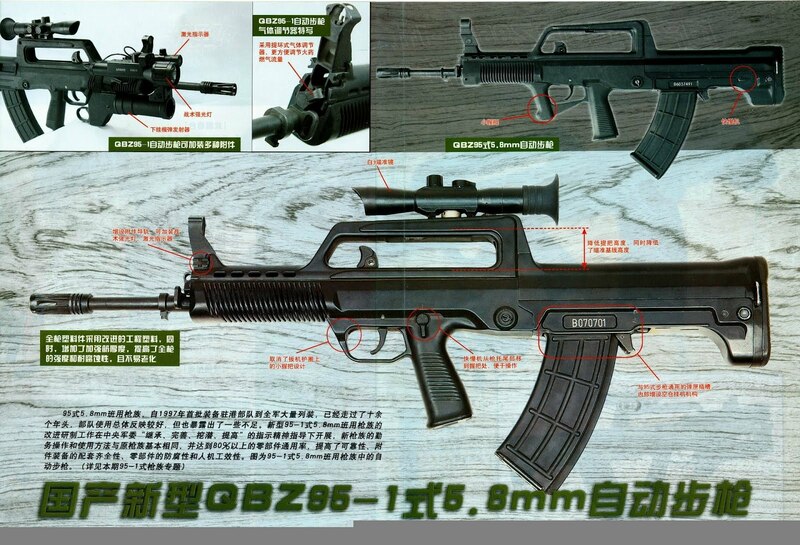 So, adopting an essentially "heavy round" as the future standard general purpose round for all Chinese 5.8x42mm chambered weapons, replacing all different dedicated 5.8x42mm round now in service, the DBP10 forced Norinco to add a thicker 18.2" "heavy barrel" on the QBZ95-1, which, in combination with the much more high quality DBP10 round, gives the rifle a claimed accuracy of R50 <6.6cm at 300m. 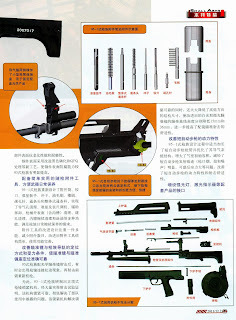 Any more internal modifications are comparably minor, as the short-stroke gas-piston with rotating bolt system used in the QBZ95 family already earned the praise of its operators for its reliability under adverse conditions, its very low weight, its simplicity and ease of maintenance. In general, disregarding the fact that this major "A1" update was probably mainly aimed at fixing the mentioned major flaw of this rifle. 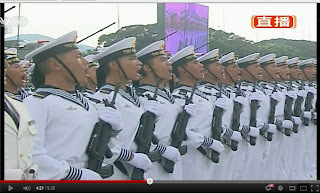 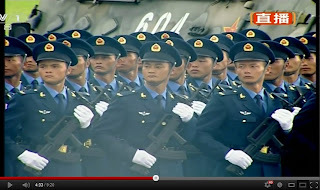 The first public appearance outside of online-leaks and specialist literature of the newest PLA service rifle QBZ95-1 once again in the hands of the PLA soldiers of the Hong Kong Garrison Brigade, does indicate that the much rumored "internal struggle" between the supporters of the QBZ03 conventional rifle and the supporters of the QBZ95 series bullpup rifle, was more or less just another baseless claim. 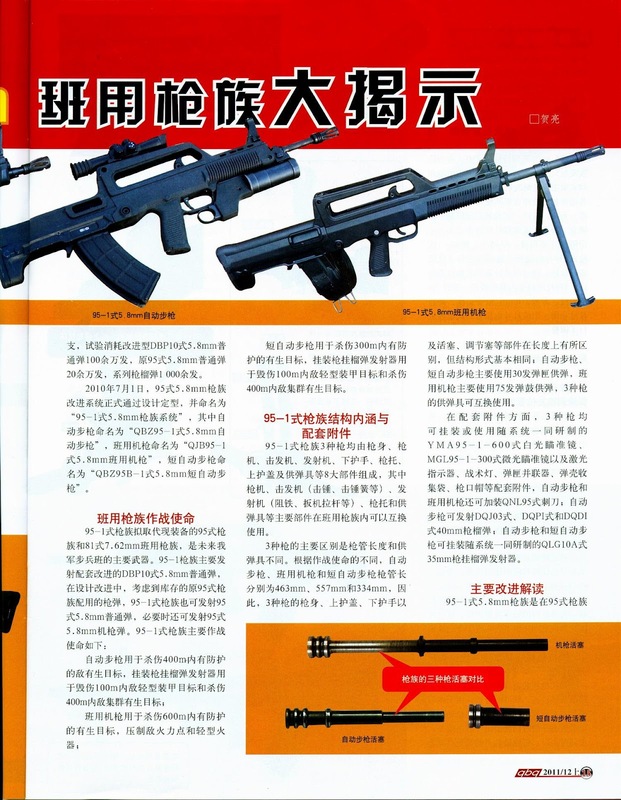 In any case, the QBZ95-1 along with its LSW variant QJB95-1 and its carbine variant QBZ95B-1 "won" any internal competition and will now serve as the updated standard service rifle in the ranks of the Chinese armed forced, while the QBZ03 reportedly never received any updates or even proposals of updates. 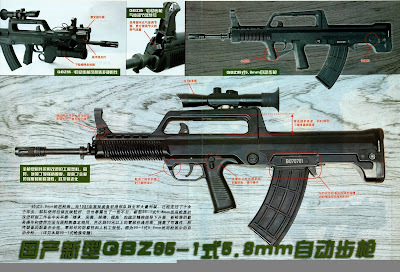 All these small and big improvements contribute to the overall ergonomic and lethality of the QBZ95-1, a result that is worth more than the sum of its parts - but that has no worth at all without the fixing of the major flaw presenting in the misplaced selector switch. 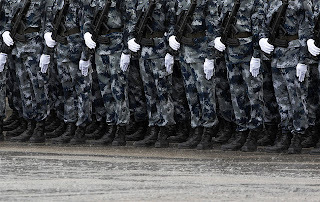 Likewise, the evolution of the QBZ95-1 should not just stop now, and continue to move forward along with the changing nature and demands of the PLA. 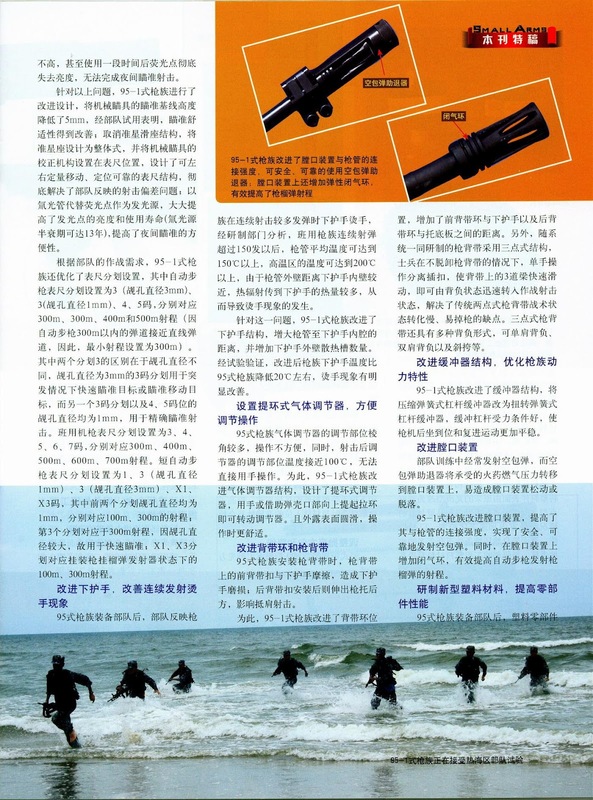 Especially improvements in terms of tactical flexibility by transitioning to a more common rail mounting systems like the MIL-STD-1913 Picatinny from the present proprietary Chinese rail-mounting system would be an obvious candidate for future QBZ95 upgrades. A much expected adoption was denied for this version of the assault rifle for different reasons not further explored here. 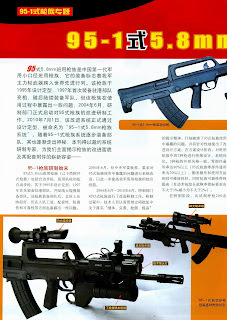 Now, with the PLA having had enough time to operate and report the flaws of the QBZ95 since its introduction 15 years ago, and with enough time for Norinco to work out those reported flaws, all without rush for the sake of whatever reasons, the QBZ95-1 presents itself in its newest iteration to the world at the 15th anniversary of the same world-changing event that was probably one element amongst all the many indications leading to the creation of a modern Chinese assault rifle.